Share any problems which you have with the rail, panels, opener or remotes and we will provide the perfect gate repair in the fastest possible manner. Our company has professionally trained technicians who are equipped with expert knowledge, advanced tools and spare parts of the highest quality. This makes our team capable of providing any type of fix to any of the system components. In addition to providing scheduled repair, we run an emergency service to get you out of serious trouble on the spot. Our installation services cover entire electric gate systems and separate components like panels and electric operators. The work is done with the utmost dexterity so that the desired result is achieved in no time. 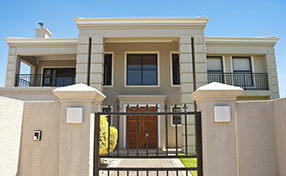 All property owners can take advantage of our professional maintenance services. Nevertheless, we understand that not everyone aims to have a whole new mechanism installed – many people actually prefer their old ones, as long as there is no fatal damage. With time though, usage becomes more and more obvious. When you spot deformities or notice a slower operating speed, it is time to give us a call so we can come and inspect the site and see what goes wrong. 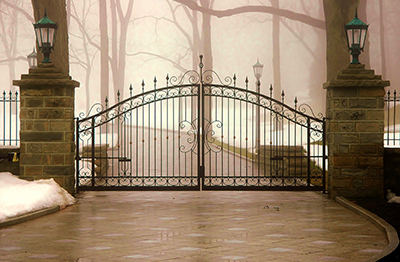 We have our professional swing gate repair service, by which we can fix any part that has suffered damage due to intense or abusive usage. Sometimes it's the swing gate operator that causes troubles. These parts ask for knowledge and skills, therefore you have to call for a technician to inspect the matter. If the operator is broken, we can either repair it or replace it. Either way, it is going to be affordable and won't take long. We like to solve things without wasting time or postponing for another day. Your gate will function smoothly again, responding to the commands each time. Malfunction, as seen before, is often caused by a simple misalignment of components or by loose parts which need to be tightened up. In some other cases, pieces can change shape because of excessive weight that pressures them. In these situations we can easily interfere and repair what's in bad shape. A simple swing gate adjustment is usually enough to bring things back to their original efficiency. You can then enjoy again a perfectly functioning door, be it for the driveway to your home or for a commercial/office space. 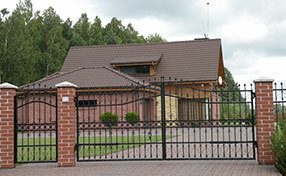 Our company also caters to finesse details, such as the gate system parts that deal directly with the electricity. We have repaired motors that action the gates, and swing gate safety loops sensors as well. Loops are placed in front and behind a gate, and their role is to prevent it from closing on a vehicle. The common installment is one detector with sensor having two loops connected. Apart from these works, our company also caters to damaged or broken swing gate hinges, and you can be sure that each ans every part we replace comes from a trusted brand, as we put quality forward. Once you have the entire system repaired and working again flawlessly, it doesn't mean it will stay like this forever. However, what you can do is to avoid severe issues by opting for good maintenance services. 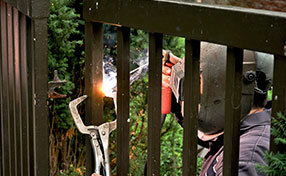 You may contact us for swing gate post repair services. After some time, many clients return because they have thought of making an upgrade and they want us to perform it. The swing gate Santa Clarita company is ready to hear about your plans.